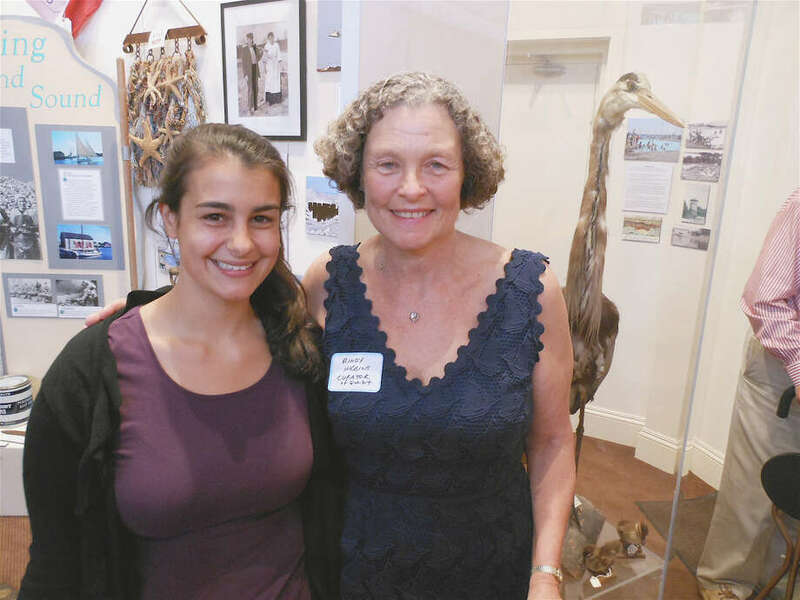 Jenny Gazerro, left, a former educator who worked at Norwalk's Maritime Aquarium, joins "The Sound and the Saugatuck" exhibit curator Rindy Higgins on Friday at the Westport Historical Society. A buoyant crowd turned out Friday to absorb all the information showcased in new Westport Historical Society exhibits on Westport's unique relationship with the Saugatuck River and Long Island Sound. In addition to unveiling the exhibits, "The Sound and the Saugatuck" and "Watershed Moments," the event also celebrated the renaming of the historical society's Little Gallery as the Mollie Donovan Gallery, a tribute to the longtime historical society volunteer and supporter of the local arts community. "The scope of the exhibit is immense," said Rindy Higgins, a 21-year veteran marine educator at Norwalk's Maritime Aquarium and guest curator of the new show. "It includes vintage photos, as well as 50 contemporary shots by Larry Untermeyer, extensive informational captions, scientific data and multiple 3-D artifacts related to oystering, clamming and lobstering." Higgins' background influences the feel, educational content and multi-sensory approach to the exhibits, including a soundtrack of shore birds and crashing waves. She is also the current director of the Sherwood Island Nature Center, is a member of the Westport Shellfish Commission and was a correspondent for the Norwalk Hour writing columns on shellfishing, which formed the basis of "Raking It In," a 52-page booklet she is offering at the historical society. "We all live in a major watershed, extending from Long Island Sound up to Quebec," she said, leading a tour of the exhibit. "We are in the Saugatuck watershed, of which the Saugatuck River is the dominant waterway. The exhibit takes you down rivers and through history from about 10,000 years ago to the present, and even into the future. We hope people will leave here feeling more committed to doing activities at home to positively protect the watershed." Higgins noted that the displays are appropriate for both adults and children. This summer, she will be teaching a junior marine biologists workshop at the center. The Saugatuck River has seen better days, she pointed out, with a dramatic drop-off in bottom-dwelling fish, resulting from dredging, landfills, dams and heavy recreational use. Historically, Long Island Sound was once a freshwater lake. Native peoples settled the area 9,000 years ago and used shells as an early form of money. European traders moved in and trade flourished. Even notorious characters like Captain Kidd appeared on the scene. Commercial development and shipping began in the 1700s, and local crops were exported worldwide. In the mid 1800s, agriculture gave way to industries that turned out textiles, leather and buttons. Untermeyer said the majority of his photographs were shot over the past 10 years in, around and above Westport, and include shoreline birds and animals. "I'm always out shooting," he said. "I'm really a photojournalist. It's my later-life passion." About the dedication of the gallery in Donovan's honor, Susan Wynkoop, the historical society's board president, commended her "tireless efforts at WHS and dedication to the arts community."